Realistic asphalt tire sounds that resonate depending on how fast you are accelerating and what speed you are in, giving a feel for your sense of speed. 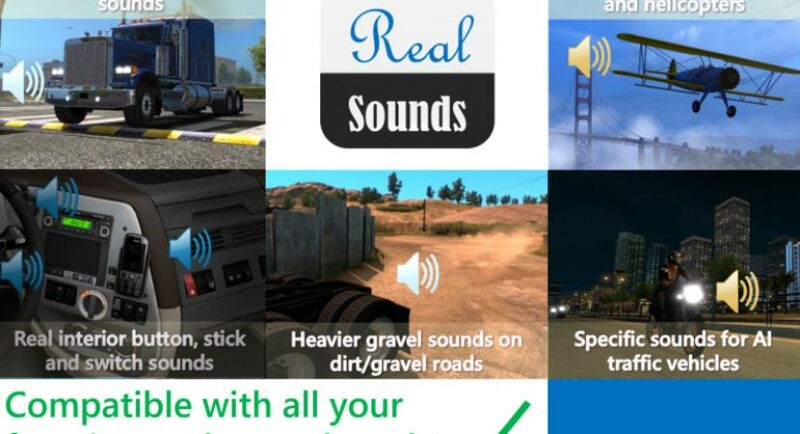 Heavier gravel sounds when driving on dirt or gravel roads. 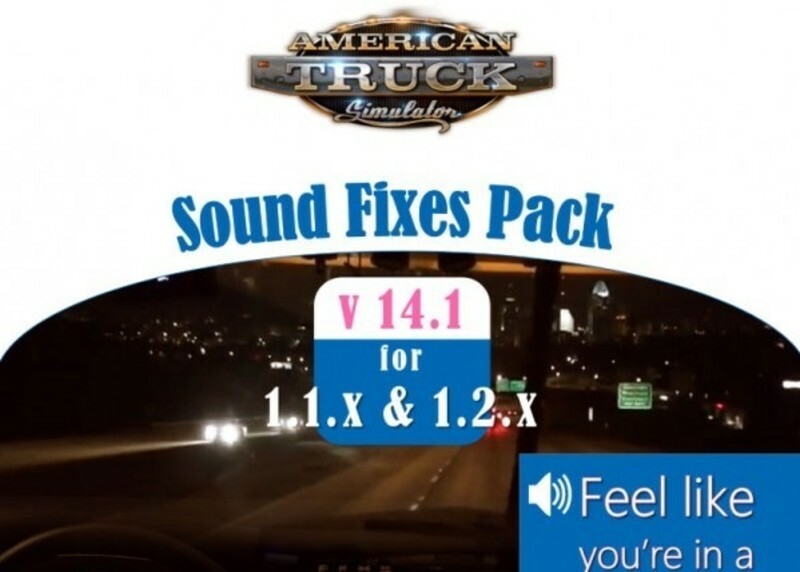 Increases range of suspension sounds from just tire suspension sounds to cabin, trailer and tire suspension sounds. Light impacts trigger speed bump or irregular road surface suspension sounds. Medium impacts trigger squeaking of cabin. Very hard impacts may trigger the sound of a key swinging. “Late music” replaced with Nokia phone ringtone sound (Volume of this sound depends on Music volume in Audio settings in-game). “Bing bong” chime for train loading screen sound and ferry loading screen sound. Reworked garage door sound and corrected its volume to a lower level. Reduced volume of adviser message sound. Reduced volume of yawn slightly for fatigue simulation. Classic/historic ding sound for while the fuel is pumping (circa 1960s to 1970s). The number of dings give you an idea on how much you refueled. Real fuel pump, fuel lid sounds, door close and key insertion sound effect for after refueling to a full tank. Mix of stock amplified gear grinding sounds and new gear grinding sounds. Can be heard when you have damaged the transmission and gearbox. Increased volume for interior stick sounds: parking brake stick, blinker stick lever. 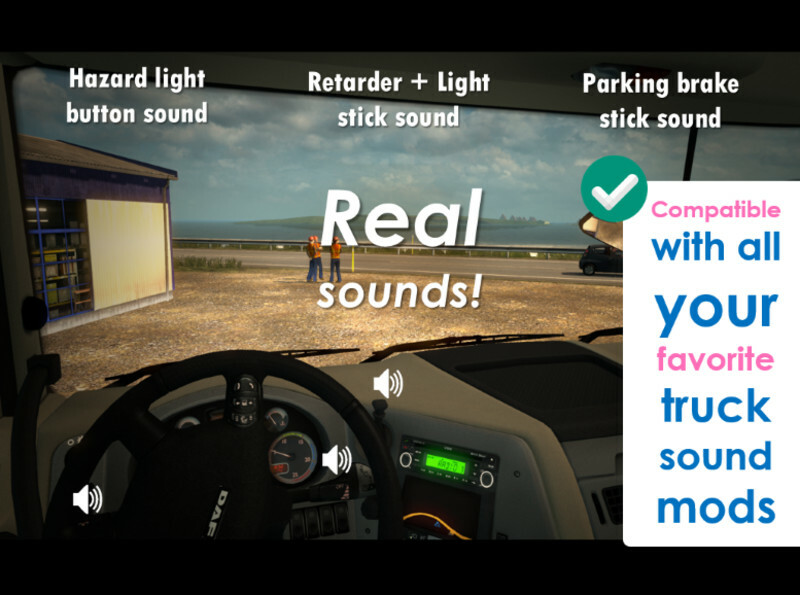 Real stick/switch/button sounds for: parking brake, hazard light, blinker / indicator / turn signal, light switch. Retarder sound changed to real retarder sound. 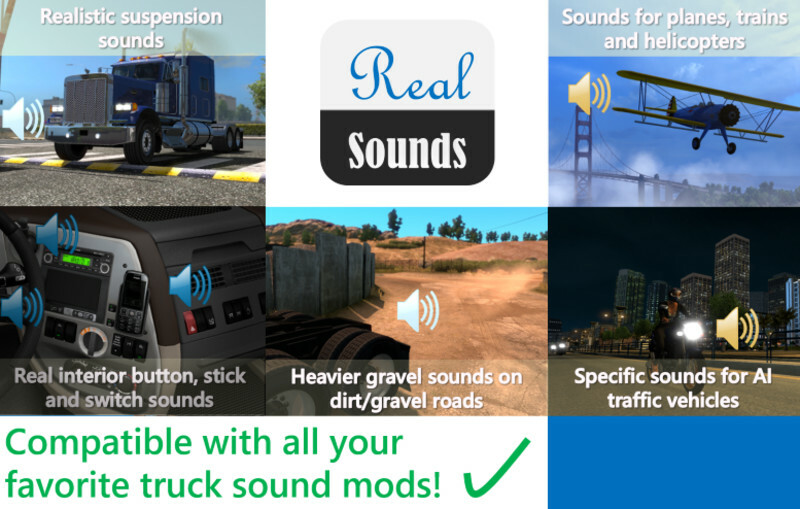 Lift axle sound now includes button press sound effect. Real sound effect for trailer coupling. Also includes the sound of the trailer brakes connecting straight after the fifth wheel coupling. Driver Alert Support system sound installed on all trucks (ETS2 exclusive feature). AI traffic trucks/buses given more variations of sounds (turbo, engines, gear changes). Motorcycles from Jazzycat’s AI traffic pack given proper motorcycle engine sounds. Motorcycles will rev engine instead of using car horn when blocked. You can hear the slight sound of vehicles overtaking you or passing by you in the oncoming lane. Wind will sound slightly faster from cabin when you drive at a high speed. Pattering of rain on windshield audible inside the truck during heavy rain. 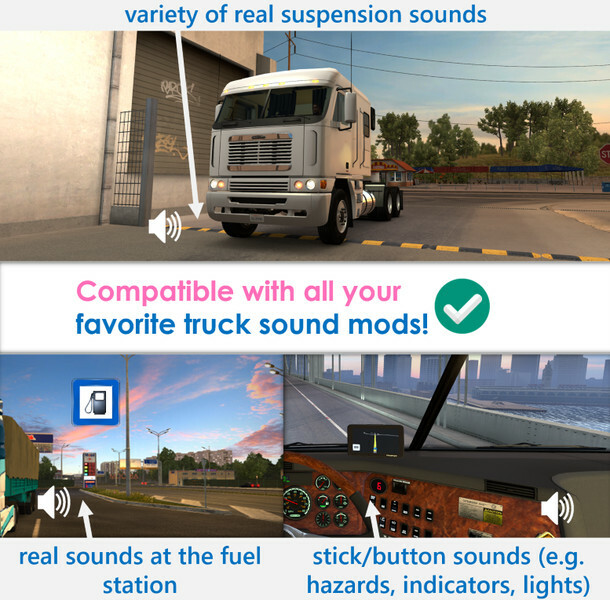 Compatible for and tested on ETS2 version 1.23.0 + ATS version 1.1.1. 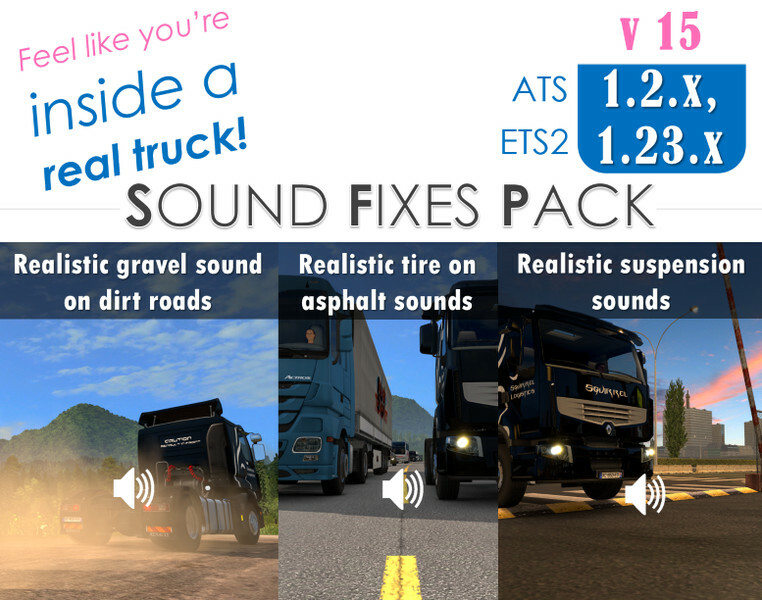 Supports compatibility with Realistic Weather Sound 1.7.4 (provides realistic thunder and exterior rain sounds). 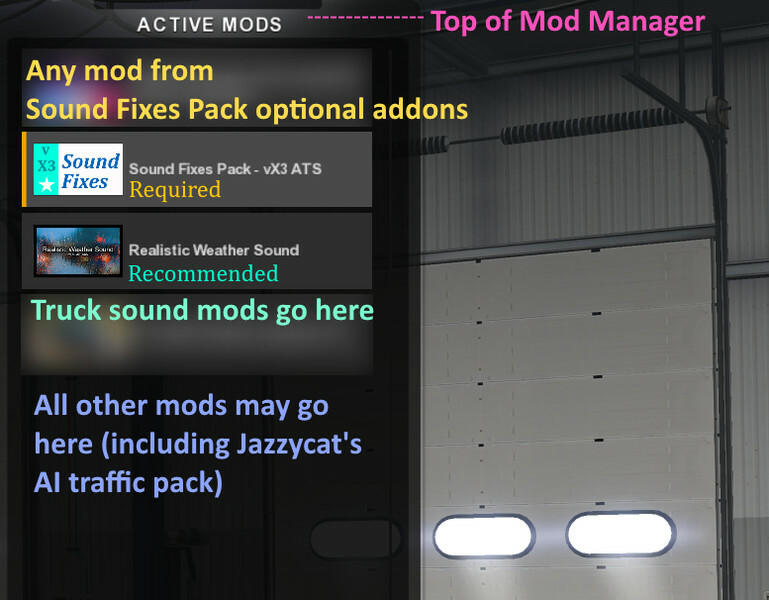 Both mods can be enabled at the same time. Check load order image for more details. May be found in the Options folder when you download the pack. If using these options, make sure to enable the option with higher priority than the Sound Fixes Pack for the sound to take effect! 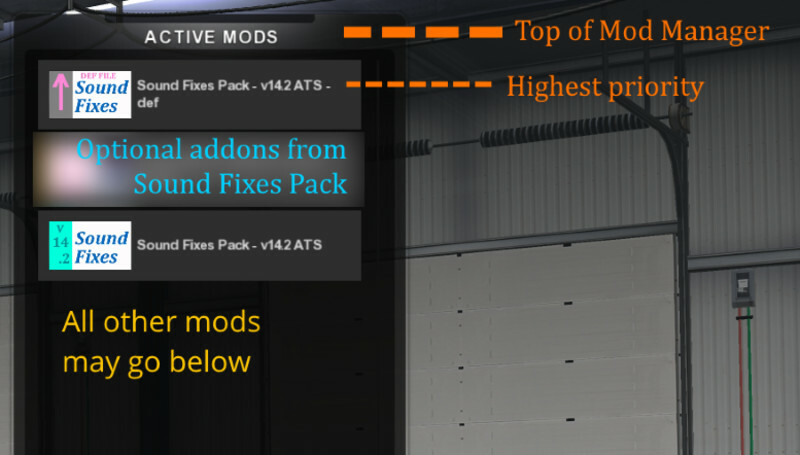 Mod requires higher priority than mods with a game_data.sii file. Otherwise, correct operation of pack not guaranteed.